I was not happy to realize that I had only allowed one week for the interwar period, and it had to include Zionism and Palestine. This isn’t the first time that my syllabus seemed to have been created by a phantom whose plans were different than mine. I decided to turn the dilemma into an opportunity: I would connect the issues attending the new postwar borders and identities with the development of political Zionism, to embed the Palestine mandate into the regional—and global—history of which it is part. 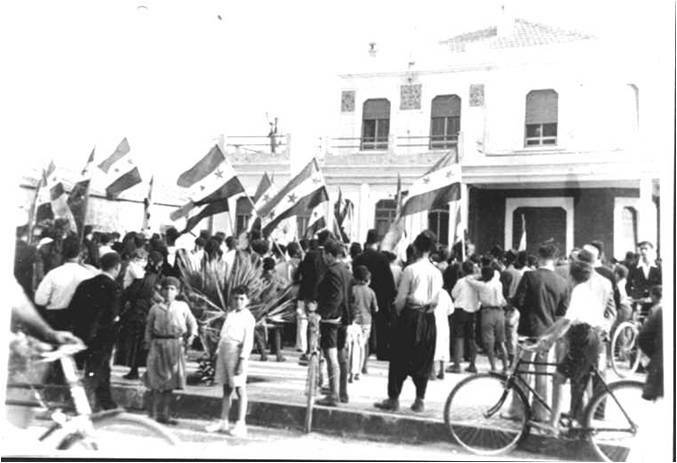 Yusuf, a fisherman in the coastal city of Alexandretta, was intercepted by Nedim Ward and two other Arab nationalists sitting at Ali’s café on the morning of May 4, 1938. They demanded to know why Yusuf, an Arabic-speaking Alawite, was wearing a hat with a brim, symbol of Kemal Ataturk’s revolutionary Turkish nationalism. A poor man, Yusuf responded that he had no other head covering to wear. Nedim Ward handed Yusuf twenty francs, telling him to go buy himself a fez. In response, Yusuf ripped off his own brimmed hat, threw it on the ground, and immediately purchased a fez from a nearby shop. As he was leaving the store, he encountered two Turkish nationalists, who crushed his new fez and demanded, “Come, show us who destroyed the hat.” When the Turkish nationalists encountered Nedim Ward and his friends, the confrontation described in Alexandretta’s police records began. My research suggests that national identities in the Middle East did not emerge before World War I, except among small groups. For many, like Yusuf, a hat was simply a hat and not an identity–they already had many collective identities and nationalism had no resonance. That meant presenting Sharif Husayn not as an Arab nationalist (as Antonius had in his classic The Arab Awakening), but instead as a would-be King seeking his kingdom from the British. Rethinking the emergence of nationalism requires providing a different narrative of the interwar period that focuses on anti-colonialism instead of identity politics. The new frame helps place Zionism in a broader context. The Zionist movement was a European-style nationalist movement, dissimilar from the anti-colonial sentiments that drove the 1920 opposition to British and French occupations in Iraq, Palestine, and Syria. To talk about Zionism, I actually began with the “Jewish Problem,” centuries of attacks on Europe’s Jews based, first, on religion and then on race. After providing some details, I asked the students to think about the treatment of Ottoman minorities under the Tanzimat, and the problems of how to deal with internal “others.” What were the options for resolving the “Jewish Problem,” I asked? I should have anticipated their reticence. They did, after a bit of persistence, come up with the various alternatives: conversion (more difficult after racialization), expulsion, ghettoization, assimilation, or state-creation (like Liberia). Then we moved to France in 1870, the aftermath of French defeat at the hands of the Prussians. The parallel with the Ottomans was striking: how to deal with defeat? Return to the faith (construct Sacré Coeur basilica)? Or modernize (Eiffel Tower), especially the army? It was the latter, the creation of a military meritocracy, that led to the rise of Captain Dreyfus, a Jew, to the rank of Captain. The students, I hope, understood the parallel—the range of Ottoman responses to defeat were remarkably similar. Covering the humiliation of Captain Dreyfus for treason based on little evidence (and subsequently overturned), assimilated Austrian Jewish journalist Theodor Herzl decided that, if the French couldn’t provide equality to Jews, no one could. They needed a state of their own, because, he argued, Jews were a nation. He rejected the other options the students (and Herzl’s contemporaries) had proposed, claiming none would solve the “Jewish Question.” This new kind of Zionism was based on nationalism, the idea that the Jews were a separate nation that could never fit in anywhere else. The Zionists decided that they needed to establish their state in Palestine. How could they decide to set up somewhere that others already lived? I showed them the map of the world c. 1914, in which Europeans obviously had no hesitation about controlling lands on other continents. The Palestine to which the Zionists arrived was the southern part of the Ottoman province of Syria, in the midst of Tanzimat reforms, self-strengthening movements, and debates over how to move into the future. Zionists insisted that the lack of national identity in the region meant no one else had rights to the land; only nations had claims to territory–consistent with European notions–and the Palestinians were not yet claiming a specifically national identity. The existence of farms and schools and churches and mosques and cemeteries were not relevant to those whose political and ideological world was circumscribed by notions of nation. This entry was posted in France, Israel, Ottoman Empire, Palestinians, Syria, Uncategorized, Zionism by Sarah Shields. Bookmark the permalink. So very impressive; as a medievalist who teaches a survey on the modern Middle East, you approaches are quite enlightening. I just introduced the segment on the “creation of the Modern Middle East” from the three DVD set “The Wonderful World of Albert Kahn.” The class had a good discussion on the imagery and perspectives of the individuals covered as well as the perspectives of the producers of the DVD in their choices for coverage. If you haven’t (and I suspect you have) the Albert Kahn DVD series (from the BBC 1996 production) is worth a looksee in my humble opinion. I haven’t been commenting on your posts, but I would like to mention that I read all of them, and I really appreciate them. They’re a really useful summary of the main concepts, and they help me keep my own lessons in context. I think the students in the class would find them really helpful as well (as a supplement to attending class, of course–not as a replacement). I really enjoyed both your notes for this class and the Albert Kahn documentary. In one of the three sections on the Inter-war period that I lectured for the class I am TA-ing I showed the part about the Mandates. (it may be found online via youtube).